This is truly bizarre. 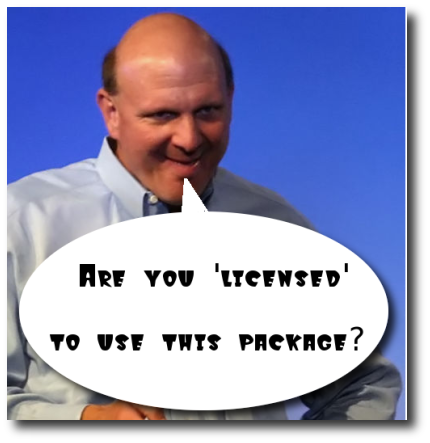 Why would Microsoft unload a bunch of “Linux-focused patents” – stuff you would think it would fondle lovingly as it ruminated endlessly on the damage they might do in terms of FUD, if nothing else. But no, not only does Microsoft sell them, but they end up in positively the worse place possible, from Microsoft’s point of view: a Linux-friendly bunch with the avowed aim of keeping such patents safely locked away. I have long believed that software patents are like landmines, devices that have unpredictable destructive power, and a threat to innovators who often cannot know of their existence until the damage has been done. This latest chapter in the story tells me that they are more dangerous than ever, and that it is more urgent than ever to mount a serious campaign to disarm them all, before it is too late. If we can elect a government that believes that “open source is the best form of civic participation”, then we can surely find the political will to make open source (and free software) innovation 100% legal. There are many places to make your voices heard. In the USA, you can start with End Software Patents. In Europe, No Software Patents!. And there are many others. It may seem like a bother, but sometimes political action is needed to enjoy necessary freedoms. Microsoft lobbyists are directly opposing these initiatives using AstroTurf techniques. Will IBM help support the likes of FFII or will it carry on lobbying to keep software patents in tact by lying about Free software? …a recent nugget buried in IBM’s amicus brief for the Bilski case takes a novel slant on the issue. Big Blue told the US Supreme Court that software patent lockdowns are actually the secret to open source’s success. Any remarks, Bob? Will IBM make a public retraction like it typically does after such blunders? In our recent discussion about another bad idea for a new type of DRM that will surely fail, Steve R. pointed us to an article in Forbes about Intertrust, the DRM company, who apparently is cooking up yet another DRM scheme. But, unlike the system we talked about in the original post — where the guy noted that the concept had to be widely adopted as a standard, and not protected, Intertrust goes on and on and on about how it’s got a ton of DRM patents to protect this new DRM scheme. This isn’t a surprise. Intertrust’s entire business model was based on suing Microsoft for patent infringement. Clearly, Microsoft has increasingly been spreading fear, uncertainty, or doubt (FUD) about Linux, as it has about Apple’s Mac OS X in its recent “Laptop Hunters” TV ads. Last month, Dell Computer took it upon itself to stand up and refute Microsoft statements about high Linux netbook returns, saying that Dell’s Linux returns were roughly equivalent to those for Windows-based netbooks. Canonical has also questioned Microsoft’s statements about netbook returns. Meanwhile, anecdotal evidence suggests that Microsoft has been increasing its pressures on both PC vendors and retailers to steer clear of Linux netbooks. Microsoft appears to be taking Linux seriously, despite the fact that by some counts Linux represents only a single percentage of the overall PC market (others place it higher, but not by much). In an SEC filing posted this summer, Microsoft added Linux distro vendors Canonical and Red Hat to its list of perceived competitors for Microsoft’s Client division.